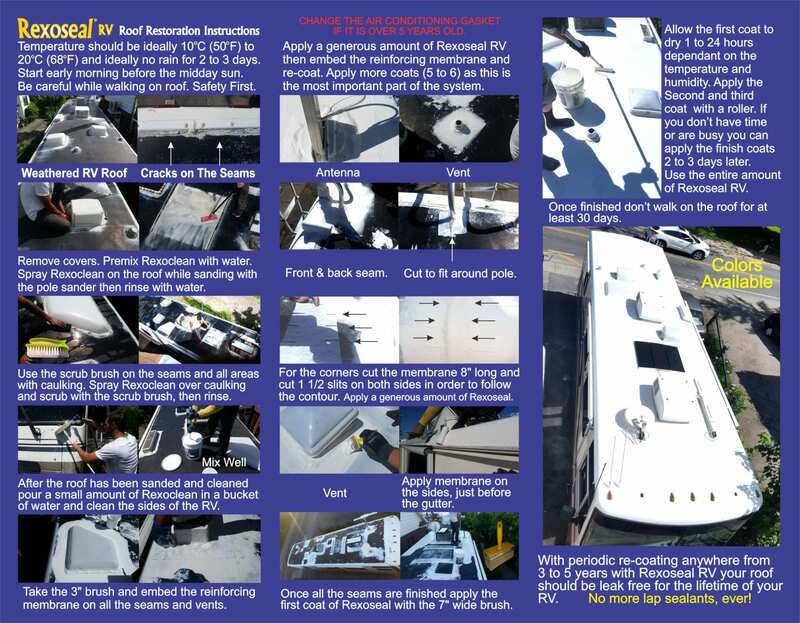 RV Roof Systems - Rexoseal | The Original Waterproofing Coating System! Can be applied over wood, metal, aluminum, concrete, rubber and fiberglass. Added mildewcide protection against mold, algae and microbial growth. 10year limited warranty, but with periodic recoating will last the lifetime of the RV. What maintenance is required after application of the Rexoseal system? Just clean with a mild soap and water, no power washing. How many years will it last? The limited warranty is for 10 years, but with periodic re-coating every 4 to 5 years it should easily last the lifetime of the RV. Do I have to take off the existing lap sealant? No, only remove what is loose, but you need to properly clean the seams before applying Rexoseal. Does it have a strong odour? No, it is a water based environment friendly product with almost no VOC’s. Should I wear gloves and what is the clean-up? Yes, you should wear nitrile gloves and clean-up is with soap and water. Once applied will it chalk and leave white streaks on the sides? No, Rexoseal has been independently tested in weathering machines and results showed no chalking. How does Rexoseal stand-up to the Florida sun? Special additives have been added to withstand harmful UV rays. Will it crack and peel-off while driving my RV, like some sealants do? No, it remains flexible, even in cold temperatures. How long do I have to wait between coats? It depends on the temperature and humidity. At 68 deg. F with little humidity it should not take more than an hour, but it still may be tacky so you would need to be careful while walking on the roof. You may need to wait 24 hours or if you are busy and have no time the next day you can re-coat in 2 to 3 days. Does Rexoseal come in colors? Yes, we commonly tint it tan or grey. I still have half the product left and I applied 3 coats as the instructions says. Yes, you applied 3 thin coats, you need to apply the entire contents even if it takes 2 more coats.